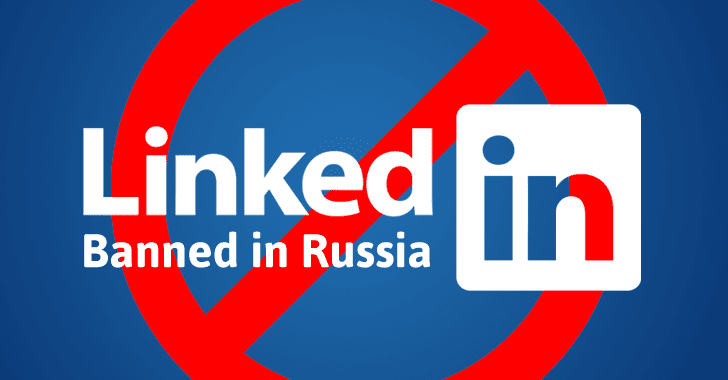 As reported late October, the world's largest online professional network LinkedIn is going to ban in Russia beginning Monday following a Moscow court decision this week that found Microsoft-owned LinkedIn to be in violation of the country's data protection laws. In July 2014, Russia approved amendments to the Russian Personal Data Law that came into force on 1st September 2015, under which foreign tech companies were required to store the personal data of its citizens within the country. Legislation put in place for protecting its citizens' data from the NSA's worldwide surveillance revealed by whistleblower Edward Snowden. The Russian state's federal media regulator, known as Roskomnadzor, is now threatening to block any company that stored its citizens' personal data on non-Russian servers. Facebook and Twitter could be Next to Get BLOCKED! Not just LinkedIn, even other bigger companies, including WhatsApp, Facebook, and Twitter, could be next on the list of getting blocked in Russia if they fail to comply with the law. Major companies, including Google, Apple, and Viber, have reportedly moved some of their servers to Russia this year, although Facebook, Microsoft, and Twitter denied complying with the law. LinkedIn is the first big name to fall for not complying with the law, as a Russian court upheld a ruling to ban the professional network from operating in the country, the New York Times reports. "The Russian court's decision has the potential to deny access to LinkedIn for the millions of members we have in Russia and the companies that use LinkedIn to grow their businesses. We remain interested in a meeting with Roskomnadzor to discuss their data localization request." It seems that Roskomnadzor has chosen LinkedIn its first target due to the company's history of security issues. The massive 2012 LinkedIn hack exposed over 117 Million passwords and usernames. The ban could take effect on Monday, with Russian internet service providers (ISPs) blocking access to LinkedIn's web address. LinkedIn, which has some 5 Million users in Russia, could still appeal the court's decision to avoid being blocked across the country. Roskomnadzor – known as the Federal Service for Supervision in the Sphere of Telecom, Information Technologies, and Mass Communications – is Russia's telecommunications watchdog that runs a huge blacklist of websites banned in the country. Russia is not the first country to enforce data localization law on foreign tech companies. A few months ago, Iran also imposed such regulations on all foreign social media and messaging apps to move 'data and activity' associated with Iranian citizens onto servers in Iran within one year.